DealSim is a telecomunication company based in Israel. Our technology platform, Cel4U, has been providing telecommunication solutions since 2011. We provide a Smart & Simple mobile solution from the moment you arrive to Israel. All of our packages include unlimited calls and high speed data up to 5GB. We provide you with a local Israeli phone number with unlimited calls inside Israel so that everyone can stay connected with you. 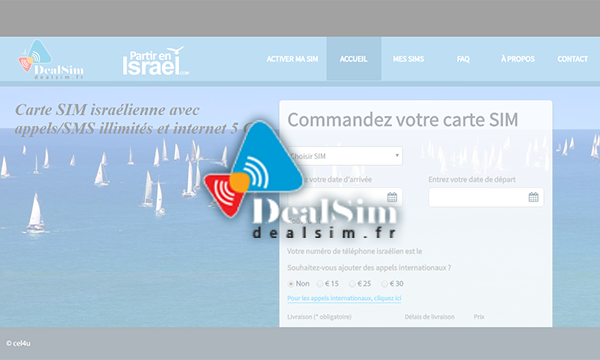 After you purchase our service through www.dealsim.com – we will send your NEW Israeli SIM Card to your home address. In that way, when you arrive to Israel – just like home – you are still connected. DealSim provides you with an economical solution for you to stay connected 24/7. Smart & Simple.